Districts should request guidance for survey activities related to hydraulics for Bridge designed structures as early in the design process as possible using the Bridge Survey Location Request Form. A form should be submitted for each structure location and preferably in groups rather than individually. Applicable portions of this document are filled in completely by the district. Crossings with small drainage areas should be evaluated to determine if Bridge Division or the district is responsible for the design of the structure. See EPG 750.7.4.3 Summary of Responsibilities for more details. Page 1. Describe the location of the crossing from features readily identified on maps such as towns or other state routes. Complete the High Water Elevations at Proposed Bridge Site table using water elevations at survey centerline. Provide location information for new bridge and any additional information that may be helpful in determining the location of valley sections and profiles (i.e. levees overflow structures, nearby dwellings in the floodplain or other items that may not be easily recognized in aerial imagery). The Bridge Survey Location Request form(s) is submitted to the Bridge Survey Processor thru ProjectWise. To submit the Bridge Survey Location Request Form(s), place the file(s) in a folder under the district Design folder in ProjectWise (it is preferred that this folder be a designated folder named “1-BR Survey Locations” or similar rather than using individual job folders), then send an email to the Bridge Survey Processor that includes a list of the files placed in ProjectWise and a link to the folder. The Bridge Survey Processor will notify the district when the files have been accepted, so that the files may be removed from ProjectWise. The Bridge Survey will notify the bridge contact person and Bridge Division will process the request, providing the completed form and additional information to the district contact listed on the form via an email which will contain a link to the file location in SharePoint. The Bridge Survey Location Request form should not be provided to consultants when the contract includes completing both the Bridge Survey and preliminary design of a bridge. EPG 747.2 Bridge Surveys is provided as supporting information and guidance for the preparation and submittal of bridge surveys and is to be used in conjunction with the Bridge Survey Checklist. A proper procedure for, and a methodical approach to the analysis and computations for preparation of a bridge survey will result in a realistic recommendation for the proposed structure. A Bridge Survey consists of the Survey Report along with applicable files and documents listed in EPG 747.1.2 Bridge Survey Submittals. Most documents for a Bridge Survey are submitted on standard sheets which are available in Word or MicroStation. Bridge surveys prepared and submitted to the Bridge Division by the district provide the basis for preliminary bridge layouts and ultimately for the preparation of bridge plans by the Bridge Division. Care exercised during the gathering and preparation of bridge survey data will be reflected throughout the life of the proposed bridge. The hydraulic design of the bridge waterway opening for a stream crossing is almost entirely based upon bridge survey data gathered in the field or from aerial photographs. Bridge surveys for grade separations should accurately describe geometrics, grades and other pertinent features of the proposed improvement. When new grade separation structures are to be incorporated with existing facilities or when existing structures are to be widened or rehabilitated, the bridge survey should reflect geometrics and grades of existing facilities as they exist. Seldom are existing geometrics and grades the same as shown on original design plans. Bridge survey data should include all information regarding the bridge site which will have a bearing on the bridge layout and design. Consulting engineering firms retained by the department to prepare bridge layouts should contact the Bridge Division for additional requirements beyond those listed in this article. All applicable portions of the Bridge Survey Report form are filled out by the district. Crossings with small drainage areas should be evaluated by the district to determine if Bridge Division or the district is responsible for the design of the structure. See EPG 750.7.4.3 Summary of Responsibilities for more details. Page 1. Describe the location of the proposed bridge from features readily identified on maps such as towns or other state routes. Provide data for the existing MoDOT bridge that is on or near the alignment of proposed bridge. Complete the High Water Elevations at Proposed Bridge Site table using water elevations at survey centerline. Page 2. Provide information on any improvements near the proposed bridge. Such improvements may include, but are not limited to, residences, businesses, other buildings and crop fields. The data for Other Bridges need be completed when indicated on the Bridge Survey Location Request. The "Additional Remarks" space is used for general information relating to the crossing and is not restricted to remarks relating to the bridges. Information on Page 2 is used as part of the hydraulic analysis of the crossing by the Bridge Division and should be carefully completed by the district. If the crossing is over an organized drainage district ditch or encroaches on Drainage District levees, provide the corporate name of the Drainage District. Page 3. Photographs depicting the site conditions at the time of survey shall be provided. Page 4. General Instructions for Bridge Surveys. The preliminary geotechnical report provides critical information necessary for the proper layout of structures. The spill slope recommendation is needed to determine minimum structure length. The geological data provided is used to assess possible foundation types and subsurface problems thereby leading to a potentially more accurate preliminary cost estimate provided with the bridge memorandum. GEO files contain geographic information that is imported into HEC-RAS to create the geometric portion of the hydraulic model. If survey data is provided for more than one stream, a GEO file is created for each stream. If additional sections or offset profiles are needed beyond what is available in the GEOPAK to HEC-RAS Converter spreadsheet, create multiple GEO files using the same streambed profile. A GEOPAK to HEC-RAS Converter and tutorial videos are available in article Bridge Survey on the CADD Services Support web page under Power GEOPAK Road Tools – Bridge Survey. The GEO file(s) and the GEOPAK to HEC-RAS Converter spreadsheet(s) are submitted with the Bridge Survey. Centerline and Offset Profiles - Profile chains created for use in the GEOPAK to HEC-RAS Converter are created so that the stationing in the GEO file will run from left to right when looking downstream. Profile stationing for the GEO file starts at zero and may run the opposite direction of the roadway stationing. Streambed Profile(s) – Stationing for streambed profiles should begin at zero at the downstream end and increase going upstream. Valley Sections – Stationing for valley sections run from left to right looking downstream. Typical Channel Sections - Stationing for channel sections run from left to right looking downstream. Other Bridges - Stationing for sections at other bridges run from left to right looking downstream. 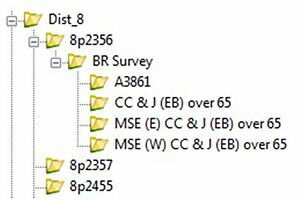 The completed bridge survey report including all applicable files and reports listed in EPG 747.2.2 Bridge Survey Submittals is submitted to the Bridge Division Bridge Survey Processor through ProjectWise. Once all the bridge survey documents are available in ProjectWise send an email to the Bridge Survey Processor indicating that the bridge survey is being submitted and providing a link to the bridge survey documents in ProjectWise. To submit the Bridge Survey, create a new folder named BR Survey under the appropriate job number in ProjectWise. 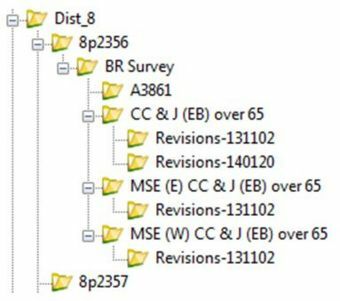 When there are multiple bridge structures in a Job number, create an additional folder for each location in the BR Survey folder. Use the route and feature crossed to designate the location (for example, B over Turkey Creek, 67 NB over 60, MSE Wall 67 over 60). Existing bridge numbers may be used for bridge replacement and rehabilitations. Once the folders have been created, copy and paste the Bridge Survey documents into the appropriate folder(s). Be sure to include all reference files associated with the MicroStation .dgn files. To create a link, left click on the ProjectWise folder, left click in the address bar to highlight the contents, and then right click and select copy from the dropdown menu. Right or left click in the body of the email and click on the paste icon. To prevent confusing revised documents with the original documents or previous revisions add the suffix "Rev" with the revision number to the file name (for example, 001_jobnumber_brplanRev1.dgn). Subsequent revisions if required would be 001_jobnumber_brplanRev2.dgn, 001_jobnumber_brplanRev3.dgn, etc. To submit revised Bridge Survey documents, create a new folder named Revisions-“todays date” (yymmdd) (for example, Revisions-140811) in the appropriate BR Survey folder or location folder and, copy the revised documents into the folder. Be sure to include all reference files associated with the MicroStation .dgn files. If additional revisions are required, create a new folder using the current date for each revision to prevent confusion. E-mail the Bridge Survey Processor with a link to the appropriate folder and indicate that a revision to the bridge survey has been made. Submit Bridge Surveys at least 12 months prior to the Plans Completion Date (PCD) for nonseismic bridges to allow adequate time for preliminary and structural design. See EPG 751.1.1.5 Routine New Bridge Design Schedule for additional details. Seismic bridges may require as much as 24 months for structural design; consult the Structural Liaison Engineer for an estimate of when Bridge Survey should be submitted. Care should be taken to fill out the Title Block thoroughly and completely. For new construction, the new bridge number will not be known at time of Bridge Survey submittal. The station to be used is the station along the project roadway at the intersection of the project roadway and the roadway below/above or the center of the stream below. Consistent uniform sheet numbering and naming practices allows for quick sheet identification thereby improving the efficiency of the work flow process. The Plan Sheet is used to show a plan view of the proposed structure. Guidance about the additional requirements for Stream Crossings, Grade Separations, Railroad Crossings and Retaining Walls is available. North Arrow - A north arrow shall be prominently placed on Plan Sheet. Title - “PLAN” shall be placed at the top center of the sheet. Scale - The preferred scale for plan sheets is 1" = 100'. Where the extent of the area is such that the entire area cannot be shown on one sheet at this scale, a scale of 1" = 200' may be used, or additional sheets with match lines as required may be used. For further clarity, a larger scale may be used as long as all pertinent information fits on the Plan Sheet. Visual Scale - A scale bar showing the full length of the scale, plus ½ and ¼ lengths of the scale used on the sheet, or a scale note shall be prominently displayed on Plan Sheets. Stationing - Stationing shall be shown with stations increasing from left to right. Roadway Location Details - Show location of existing and proposed roadways with stationing, labeling, bearings and dimensions. Center details on Plan Sheet as much as possible. Horizontal Curve Data – If applicable, the horizontal curve data shall be given. Structure Locations - Show location of existing bridge with general dimensions and stationing. Show location of proposed bridge. Four Section Index - Provide small four section index map showing approximate course of streams and location of roads and bridges. Bench Marks – See EPG 238.3.36.1.1 Benchmarks. Provide location, elevation and description of two permanent bench marks. These may be moved to the Typical Section Sheet if room is needed on the Plan Sheet. Coordinate System – See EPG 238.1.4.2 Coordinate System. Provide the coordinate system (NAD83) used for the project. This may be moved to the Typical Section Sheet if room is needed on the Plan Sheet. Zone - Provide the zone (East, Central or West) for the project location. This may be moved to the Typical Section Sheet if room is needed on the Plan Sheet. Vertical Datum – See EPG 238.1.4.3 Vertical Datum. Provide the survey datum used for the survey (for example, NAVD 88) and any datum shift information should be provided here as well (for example, NAVD 88 = NGVD 29 + 1.23’). This may be moved to the Typical Section Sheet if room is needed on the Plan Sheet. Projection Factor – See EPG 238.1.4.4 Projection Factor. Provide the projection factor for the project location. This may be moved to the Typical Section Sheet if room is needed on the Plan Sheet. Existing and Proposed Incidental Features - Buildings, fences, drainage features, temporary bypasses and other improvements within the extents of the survey (see EPG 238.3.28, Man-made Features) should be shown on the Plan Sheet. Show all utilities (see EPG 238.3.29 Utilities) overhead and underground and note utilities to be placed on bridge, if any. Include location, size and flow line elevations of storm water drainage structures. Boundaries - Show existing and tentative right of way and easements on Plan Sheet. Public Land Survey Lines - Include labeled section, township and range lines when applicable. Contour Lines – Contour lines shall be provided to the limits and intervals given in EPG 238.3.36.3.5 Extent of Contours and EPG 238.3.36.2 Grade Separation. Contours at 10 ft. intervals shall be shown using a heavier line. Tie Station – The intersecting stations and skew angle for all streams, routes, railroad lines and retaining walls are to be clearly labeled where applicable. For information required for all plan sheets see EPG 747.2.3.2.1 General Information for All Plan Sheets. The plan sheet for stream crossing projects is used to show the alignment of the stream in reference to the alignment of the roadway. The information provided on this drawing is used in the hydraulic analysis for the project vicinity during flood events. The accuracy of the hydraulic analysis, the hydraulic performance of the new bridge structure during a flood event, and the determination of possible flooding effects on properties in the vicinity are all highly dependent upon the detail and accuracy provided in this drawing. Roadway Design Frequency – Plan sheet(s) shall show all valley sections and have the course of the stream plotted sufficiently to at least the limits of the valley sections. In some cases an additional plan sheet showing details in the vicinity of the bridge may be required. Plan Extents - Plan sheet(s) shall show all valley sections and have the course of the stream plotted sufficiently to at least the limits of the valley sections. In some cases an additional plan sheet showing details in the vicinity of the bridge may be required. Contour Lines - When provided in the survey data, topographic contour lines in the project vicinity, affected during flood conditions, extending at least 1,000 ft. up and down the valley from the proposed crossing are provided. Bridge Division evaluates all of the topographic elevation information in the project vicinity to aid in the development of the hydraulic analysis. Although the Valley Sections described below provide detail of the groundline information at certain locations, it is sometimes necessary for the hydraulic designer to be able to accurately develop additional valley sections based on the extent of the topographic contour lines provided on this plan sheet. As a result, the topographic contour lines should be provided to an elevation 5 ft. above the extreme high water elevation. Stream Meander - An accurate depiction of the meander of the stream, as obtained from a survey is shown to the limits of the valley sections, but not less than a distance 500 ft. upstream and downstream of the crossing. The accurate plan view representation of the stream layout is critical to the hydraulic analysis software used in the design. Where the stream has a benched bank, use a solid line for the high bank and a dashed line for the low bank. See EPG 238.3.36.3.4 Stream Meanders for additional information. Flow Direction - The direction of stream flow. Channel Changes - The location and alignment of past or proposed channel changes in the project vicinity. If a proposed channel change is to occur, the drawing should give reference to a typical proposed channel section(s) that is shown on the Valley/Channel Section Sheets or the Cross Section Sheet(s). Channel and Overbank Features - Location and description of any features above and below the crossing which could affect the course of the stream or the layout of the bridge (e.g., rock outcropping, dam, head cut). Labeling - Name of the stream, stating whether it is a river, creek, drainage ditch, ravine, dry run, etc. Valley Sections - Locations of surveyed Valley Sections, including stationing. Valley Section Location - The location of the valley sections should be located accurately on the plan sheet, including the distance upstream or downstream of the roadway centerline as measured along the centerline of the stream; as well as an orientation and skew of the section line to the stream. The valley section lines should also be located in the plan view by offset distances and angles from tie points on the roadway. Valley Section Stationing - Stationing marks should be indicated on the valley section lines, and confirmed with the cross section data to ensure that the centerline of the channel is located at the proper station. It is important that the orientation of the valley section when input into the hydraulic analysis software be “facing downstream”. Because of this need, the valley section should be stationed so that the completed cross section will represent the viewer facing in the downstream direction. Typical Channel Sections - When channel sections are provided in the survey data, location and stationing of the channel sections shall be the same as for valley sections. Erosion - Identified areas of bank deterioration and erosion within 1000 ft. of the crossing should be indicated on the plan sheet and supplemented with photographs, if possible. This will help to determine the degree of further investigation needed. For information required for all plan sheets see EPG 747.2.3.2.1 General Information Required for all Plan Sheets. Many of the criteria and principles pertaining to the layout of stream crossing bridges are also applicable to grade separation bridges. Bridge length and substructure locations are usually controlled by horizontal and vertical geometrics. Vertical and Horizontal Clearance requirements are given in EPG 751.1.2.6.1 Grade Separations. For structures spanning freeway type facilities, two-span bridges with MSE walls in front of the end bents are commonly used if the required span length is not excessive. Under Route Stationing - The stationing along the routes under the bridge are to be shown in enough detail to determine the direction of stationing and the location of stationing baseline (i.e., centerline roadway, median edge of pavement, centerline median, etc.). Labeling - The under routes are to be clearly labeled with the name of the route and direction of traffic, (for example, Route 50, SBL, NBL, Ramp 1, North Outer Road, etc.). Drainage Features - All roadway drainage features both existing and proposed are to be clearly identified and labeled. Ramps - Information for all ramps shall include: tie station, location of stationing baseline, enough stationing to determine direction of stationing and horizontal alignment. Outer Roads - Information for all outer roads shall include: tie station, location of stationing baseline, enough stationing to determine direction of stationing and horizontal alignment. Stationing - The stationing along the railroad lines under the bridge is to be shown in enough detail to determine the direction of stationing. Milepost - Railroad milepost at intersection shall be labeled. Horizontal Curve Data - If applicable, the horizontal curve data for all railroad lines shall be given. Cross Sections - The location of required cross sections shall be shown and clearly labeled as to identify the direction of stationing. See EPG 747.2.3.6 Cross Section Sheet(s). Location - The retaining wall shall be shown at the proposed location. The baseline for the wall shall be clearly labeled. Tie Points and Offset Dimensions - Station and offset dimension ties are to be given at the ends of the wall and any breakpoints (change in direction/alignment) in the wall. Offset dimensions are to be shown to the critical wall location; front face of the wall if the under route offset is critical and fill face of wall if the over route offset is critical. Horizontal Alignment - Provide proposed horizontal alignment of the wall. Provide horizontal curve data if the wall is not parallel to the centerline roadway. Typical sections provide a multitude of valuable information necessary for the proper layout of structures. Typical sections, for existing and proposed roadways, should be provided for the main line route, all under routes, all ramps and outer roads in the near vicinity of the proposed structure that may affect or be affected by the construction of the structure. Scale - Typical sections should be placed on the sheet using a scale that allows easy legibility and arranged in such a manner to provide distinction between the sections. Labeling - The title under each section should include the name of the roadway, ramp, etc. and the station limits for which the section is valid. Profile Grade Location - The location of the profile grade shall be clearly identified. Cross Slope - The cross slope and/or superelevation of each lane and shoulder shall be shown with an arrow indicating the direction of slope. Inclination of side slope(s) shall also be shown. Dimensioning - Dimensions shall be provided for all lane widths, shoulder widths, multi-use paths/sidewalks, median widths, side slopes and ditch widths. Clear Zone - The clear zone shall be shown by dimensioning from the edge of travelway and clearly labeled as such. Guardrail, Barrier Curb and Fence - The locations of any guardrail, barrier curb and/or fence either existing or proposed shall be shown along with dimension to edge of travelway, roadway or shoulder. Traffic information is typically provided for the route on which the structure is to be built. It is generally not necessary to provide traffic data for ramps and outer roads. Traffic Data - Design year traffic and construction year traffic in the form of ADT and AADT with the percentage of traffic attributed to trucks and the design speed shall be placed on the sheet near the section to which the data pertains. Traffic Handling - If provision is to be made for handling traffic in the immediate vicinity of the structure that will affect the structure in any way, a recommendation for the location of a bypass, and/or staging of construction are included. The typical section sheet can serve as a location for several other pieces of information. Survey Points and Datum - Survey control points, reference points, benchmarks, and survey datum are placed at any convenient location on the typical section sheet. Superelevation Data - The superelevation transition data table (i.e., shape file) should be shown if applicable. The three lines of ground profiles plus the proposed profile grade provide critical information used in the layout of structures. The profiles aid in determining the length of structure, allowable substructure location, span lengths, superstructure type, superstructure depth and verification of the proposed profile grade. This information is used in conjunction with the freeboard or minimum vertical clearance requirements. Existing Profiles – See EPG 238.3.36.1.3 Centerline and Offset Profiles. Three existing ground profiles are to be shown parallel to the roadway. One profile is taken at the centerline of the roadway and the other two beyond the outer extents of the proposed roadway fill on either side. For bridge replacements, the left and right profiles should be taken outside of any existing roadway fill, roadway ditches and/or drainage tributaries. For extents of profiles see Additional Information for Stream Crossings and Grade Crossings below. Tentative Proposed Centerline Profile - The tentative proposed centerline profile is provided as a starting point for the bridge preliminary design. To provide the most economical project that meets vertical clearance or freeboard requirements, changes to the tentative proposed centerline profile may be necessary. Bridge Division will collaborate with the district to determine the final proposed centerline profile. To facilitate drainage of the bridge deck, an on grade or crest vertical curve profile is preferred. Superelevation transitions that extend onto the bridge deck should be avoided if possible. Truss bridge replacements usually require a substantial increase in the profile grade due to the shallow superstructure height of trusses. Profile Key - The profile key indicates the line style, color and descriptive label (e.g., Centerline, 40’ Left, etc.) for each of the profile lines. Vertical Curve Data - The vertical profile grade line for the proposed and existing roadways are shown with the vertical curve data and the V.P.C., V.P.I. and V.P.T. labeled to the limits of the profile. Grades - Provide grades to the limits of both the proposed and existing centerline profiles. Grid Labeling and Profile Alignment - Gridlines are labeled every 10 ft. in elevation and every 50 ft. in stationing. Profiles are aligned to the gridlines so that the station labels are provided at X+50 and X+00 stations and the elevation labels are shown to the tenth place (i.e., 740). For information required for Three Line Profile Sheets, see EPG 747.2.3.4.1 General Information for Three Line Profile Sheets. Profile Extents – Three line profiles extend sufficiently beyond the limits of the proposed structure to allow a full profile of the structure to be added. Water surface elevations are shown on the plot of the three line profile. Extreme High Water Elevation - The extreme high water elevation at the immediate site of the stream crossing and at valley sections when available, as ascertained per EPG 238.3.36.3.11 Extreme High Water Elevation. Ordinary High Water Mark Elevation - The ordinary high water mark elevation at the immediate site of the stream crossing as ascertained per EPG 238.3.36.3.12 Ordinary High Water Mark. Low Water Elevation - The low water elevation at the immediate site of the stream crossing as ascertained per EPG 238.3.36.3.13 Low Water Elevation. Over-Route Profile - All profile lines should show the proposed and/or existing roadway(s) under the structure including pavement, ditches, slopes, etc. New or Altered Under-Route Profile - If the roadway under the proposed structure is also new or will have the grade(s) changed (to be constructed with the structure or in the future) then a vertical profile of the under route shall be provided for a distance of at least 100 ft. on either side of the proposed structure. The vertical profile grade line for the proposed roadway is shown with the vertical curve data and the V.P.C., V.P.I. and V.P.T. labeled to the limits of the profile. Grades for both the existing and proposed profiles to the limit of the profiles are also provided. Superstructure depth requirements are used along with the Minimum Vertical Clearances Table to establish the relation of the grades at the intersection where minimum clearances control. For vertical clearance requirements see EPG 751.1.2.6 Vertical and Horizontal Clearance. Refer to EPG 131.1.7 Deficient Vertical Clearances on Interstates for information about coordinating minimum vertical clearance for grade separation structures with the Defense Department. Existing Under-Route Profile - If the roadway under the proposed structure is existing, then the profile of the existing road shall be provided in the form of field shots every 10 ft. along the edges of shoulder, edges of pavement, and centerline of roadway for a distance of at least 100 ft. on either side of the structure. Cross sections may be provided in lieu of the profile sheet, see EPG 747.2.3.6.2 Additional Information for Grade Separations for details. Superstructure depth requirements are used along with the Minimum Vertical Clearances Table to establish the relation of the grades at the intersection where minimum clearances control. For vertical clearance requirements see EPG 751.1.2.6 Vertical and Horizontal Clearance. Refer to EPG 131.1.7 Deficient Vertical Clearances on Interstates for information about coordinating minimum vertical clearance for grade separation structures with the Defense Department. Over-Route Profile - All profile lines should show the rails under the structure along with any ditches and spill slopes. Rail Survey - Field shots of the rails shall be provided on 25 ft. increments extending for at least 500 ft. on either side of the structure. These field shots may be provided in the form of a rail profile sheet, cross sections of the rails or in tabular form. Bridge Widening Profiles – For a bridge widening, in addition to the three line profile and contracted profile, field shots are taken every 10 ft. along the gutter lines and centerline of the structure and reported on a profile sheet with the station and elevation of each location labeled. Location of Wall - When a retaining wall is to be used under a proposed bridge, a vertical line showing the proposed placement of the front face of the wall at the bridge centerline is to be shown on the profile. Ground Lines - The existing and proposed ground lines along the front face of the proposed wall are provided as a developed elevation profile. A contracted profile provides a greater extent of the profiles on a single plan sheet, and is provided for stream crossing to capture the centerline and offset profiles for the full extent of the floodplain. Existing Profiles – See EPG 238.3.36.1.3 Centerline and Offset Profiles. Three existing ground profiles are to be shown parallel to the roadway unless the Bridge Location Request provides additional guidance. One profile is taken at the centerline of the roadway and the other two beyond the outer extents of the proposed roadway fill on either side. For bridge replacements, the left and right profiles should be taken outside of any existing roadway fill, roadway ditches and/or drainage tributaries. For extents of profiles see Additional Information for Stream Crossings and Grade Crossings. The tentative proposed centerline profile is provided to the same extents as the existing centerline profile or to the point where the two profiles merge. Scale - The preferred scale for the contracted profile is 1”=100’ horizontal and 1”=10’ vertical. The scale used is noted on the profile sheet; if multiple profiles are shown on the same sheet, a scale note is provided for each profile. Grid Labeling and Profile Alignment - Gridlines are labeled every 10 ft. in elevation and every 100 ft. in stationing. Profiles are aligned to the gridlines so that the station labels are provided at X+00 stations and the elevation labels are shown to the tenth place (e.g., 740). Scale - The preferred scale for Valley Sections, Channel Sections and Streambed Profiles is 1” = 100’ Horizontal and 1” = 10’ Vertical. The scale used is noted on the section or profile sheet; if multiple sections or profiles are shown on the same sheet, a scale note is provided for each section/profile. Extreme High Water Elevation - The extreme high water elevation(s) as ascertained per EPG 238.3.36.3.11 Extreme High Water Elevation should be shown on all valley sections if available from survey data, historic data or other sources. Distance Upstream or Downstream - The distance to each Valley or Channel section should be measured along the thalweg to provide an accurate distance from centerline of the proposed crossing. This distance is provided with the valley/channel section title. Grid Labeling and Orientation - Gridlines are labeled every 10 ft. in elevation and every 100 ft. in stationing. Sections are aligned to the gridlines so that the station labels are provided at X+00 stations and the elevation labels are shown to the tenth place (e.g., 740). Additionally, valley and typical channel sections should be plotted on the drawing so that it is viewed in the downstream direction, with the stationing starting at zero to the left. Section Labeling – Valley and channel sections should be labeled in sequential order starting with number one at the upstream end, and include the distance from the centerline of the crossing (e.g., Valley Section 1, 1150’ Upstream, Typical Channel Section 2, 320’ Downstream). Streambed Profile - The streambed profile is provided to the extents of the survey data. For details on stationing and profile length, see EPG 238.3.36.3.6 Streambed Profiles. Data Review – The elevation of the low point of the valley and typical channel sections should be compared to the corresponding location on the streambed profile. Large discrepancies in these elevations should be investigated and corrected prior to submission of the Bridge Survey. Cross sections are required for railroad crossings and retaining walls, and may be provided as a substitute for profiles for existing under routes. Additional requirements for Grade Separations, Railroad Crossings and Retaining Walls are available. Cross Section File - A GEOPAK cross section file(s) is provided whenever cross sections are required. Scale - The preferred scale of the cross sections is 1” = 10’ horizontal and vertical. The scale used is noted on the cross section sheet; if multiple sections are shown on the same sheet, a scale note is provided for each section. Legend - The legend of each cross section shall include the station at which the cross section is taken and a base elevation line. Cross Section Sheets File(s) - A cross section sheet(s) corresponding to the GEOPAK cross section file shall also be submitted. Ground lines - All cross sections are to include both existing and proposed ground lines. For information required for all Cross Section Sheets, see EPG 747.2.3.6.1 General Information for all Cross Section Sheets. Profile Sheet Substitution - In the place of an existing under route profile sheet (EPG 747.2.3.4.4 Additional Information for Grade Separations), a cross section file containing cross sections taken every 10 ft. for at least 100 ft. in both directions from the centerline of the structure may be submitted. The elevation of pavement centerline, pavement edges and shoulder edges shall be shown. Drainage Features - Drainage features shall be shown. Cross Sections - Three cross sections are taken perpendicular to the tracks. One cross section is taken just before the structure, one at the centerline intersection with the structure, and one just after the structure. These cross sections are required by the railroad company to provide the perspective of a train passing through the crossing. The railroad rail bed, rails, ditches and elevation of rails shall be shown. Cross sections shall extend at least 15 ft. on either side of the centerline of the exterior tracks. See EPG 231.8 Bridge Width and EPG 751.2.6 Vertical and Horizontal Clearances. Rail Survey Profile Substitution - In lieu of the rail survey profiles, cross-sections may be obtained at intervals not exceeding 25 ft. along the railroad and for a distance of at least 500 ft. in each direction from the centerline of the structure. Cross-sections are to include rails, rail elevations, railbed, railroad drainage features, ditches and existing and proposed ground lines. Cross Section Locations - Cross sections shall be taken at 10 ft. intervals perpendicular to the face of the wall starting approximately 25 ft. before the beginning of the wall and continuing for approximately 25 ft. beyond the end of the wall. The cross sections shall include wall location and the existing and proposed ground lines and roadway elements. This procedure is a quick and comprehensive design tool that can be made part of the Bridge Survey submittal package at the consensual agreement of those involved with incorporating and utilizing it on a project-by-project basis. Therefore, use of this procedure is not required but should be considered as subject to core team discussion prior to submittal of surveys to determine level of interest on the part of both the district Design divisions and Bridge Division. It is important that any imagery attached to a MicroStation file have the capability of being preferentially turned off at the discretion of the designer(s). This procedure can provide a more complete representation of the land use around a bridge that is not included in the typical survey information. It can also be used to generate a more accurate hydraulic model. As a time savings tool, the procedure and options provided can reduce guesswork and lengthy preliminary layout and design investigations while visually enhancing unusual terrestrial features combined with complex roadway geometry through the utilization of photogrammetric data. The economical design of a stream-crossing bridge that satisfies flooding design requirements relies on the extent of the information provided in the Bridge Survey Report drawings that identify the unique nature of the stream, the stream valley and the natural and manmade features that exist within the portion of that valley that is affected by potential flooding. As a result, an aerial view that shows details of ground cover, structures and public and private improvements for the entire extents of the plat sheet coverage is a very valuable tool that can accurately tie data used for the hydraulic design of the bridge to the specific locations of the physical features that exist in the field near the project. For situations where accurate and extensive topographic information upstream and downstream of the bridge (as described in EPG 747.2.3.4.3 Additional Information for Stream Crossings and EPG 750.3.2.2 Data Collection) may not be readily available, an aerial view layer in the MicroStation Bridge Survey plan drawing that is of the same scale as the roadway drawing can be used to support design assumptions, and to better identify the best locations for additional survey data or field investigation, when needed. For any bridge project, the ability of the designer to use MicroStation’s measuring tools with combined aerial photography and roadway and bridge design geometry supports production of effective and economical design. Latest mapping should be used with filename and date recorded on/with the image for future reference and historical purposes, or at least noted in the correspondence. CADD Support Services has provided valuable information on many different procedures related to attaching imagery to a MicroStation file or converting MicroStation geometry to a format that can be viewed inside Google Earth. As technology improves, CADD Support Services will continue to update this information along with any other CADD related items on the CADD wiki site to have the most up-to-date processes for our MoDOT users. Listed below are some links to the CADD Support wiki site that contain documentation or videos on these procedures. CADD Support has provided links to available web map servers that contain aerial and quad imagery that can be utilized inside a MicroStation file. The web map server links are tied to a server with the Missouri Spatial Data Information Service (MSDIS). The aerial imagery is at 2 ft. pixel resolution. (Quality of aerial imagery depends on pixel resolution which may be different for different areas of the state. Availability of imagery is dependent upon MSDIS and some areas may not be available or updated yet.) Once the web map imagery has been attached, an image may be created from the web map imagery for the limits of the project. To use this procedure correctly, a geographic coordinate system will need to be applied to the MicroStation file first so the imagery will lay in correctly with the MicroStation data. Photogrammetry has provided for MoDOT users aerial and quad imagery that can imported into the MicroStation file. This imagery normally comes from the Missouri Spatial Data Information Service (MSDIS). The imagery will have a little better resolution (at 2 ft. pixel resolution) than the Web Map Server imagery. Keep in mind though that this is 2008 imagery vs. the 2012 imagery from the web map server. MicroStation has the capability to convert the geometry inside the file into a file format (KML) that can be viewed inside Google Earth. Once the KML has been created, it can be viewed over Google Earth imagery. The KML file also has the ability to turn on/off levels and references files that were in the MicroStation file when the KML file was created. As with Option 1, a geographic coordinate system will need to be applied to the MicroStation file first before this can be done correctly. For Options 1 and 3, there are also some online videos on these procedures that may be helpful. Elevations and geometric data sufficient to develop plans for the proposed structure, including sign attachments and special footings such as for high mast tower lights, should be provided. Any subsurface investigation required will be coordinated by the Bridge Division. Right of way and/or permanent easement limits expected to affect the location or dimensions of the structure should be provided. Examples of miscellaneous foundations, other than bridges, requiring geotechnical surveys and specific design are sign trusses, high mast lighting, etc. The district should submit the following information to the Bridge Division Bridge Survey Processor (Bridge Survey Processor@modot.mo.gov) when a foundation design is required. Providing this information as outlined below, and in a timely manner, will allow the Bridge Division to produce cost efficient designs and details for structural foundations. Foundation designs for tubular span supported highway signs will be designed as shown in the standard plans. Foundation designs for box trusses (i.e., aluminum, butterfly and cantilever, and structural steel) will be determined by the Bridge Division relative to cost-effectiveness. The Bridge Division personnel will be available to serve as a liaison between the district and involved functional units. Put the geotechnical survey into the drilling schedule. Allow time for inclement weather conditions. Drill and sample the foundation materials. Perform strength and classification tests on the soil and rock encountered in the drilling operations. Interpret the geotechnical data and report findings and recommendations for the foundation design. District Request. Unless a drilled shaft foundation is specifically requested by the district to be the only option considered, the Bridge Division will choose the most cost-efficient foundation (spread footing or drilled shaft foundation). Value engineering proposals, after award of the project, for the foundation design will not be considered and will be stated as such in the Bridge special provisions. Layout. The district is to provide stationing and offsets for foundation locations to the Bridge Division so that the miscellaneous foundation layouts can be sent to the Construction and Materials Division with other structure layouts from the Bridge Division. This procedure allows for surveying, utility marking and dispatching of drilling equipment and personnel in the most efficient manner. Geotechnical Report to the Bridge Division. The Construction and Materials Division will provide geotechnical parameters for design of the foundations to the Bridge Division Bridge Survey Processor (Bridge Survey Processor@modot.mo.gov), with a copy to the district. Location and Sign Information Layout. The district will provide detailed information about each structure. The information typically shown on the data sheet and the cross section for each structure in a set of roadway plans is necessary for the proposed foundation design computations. The quantity for footing and pedestal concrete, normally shown on the D-32, D-33 and D-34 truss data sheets, is not required with this submittal. When the use of retaining walls along the shoulder line of a roadway is required, either in cut or fill sections, the same type of wall through the entire structure length is preferable rather than incorporating an "L" type at each end when height permits. In fill sections, a concrete safety barrier curb shall be provided and shall be tied into a concrete shoulder as a roadway item. In cut sections, a type B concrete traffic barrier shall be provided as a roadway item and placed against the retaining wall at the shoulder line. Provisions shall be made to attach standard bridge anchor section (thrie beam) to eliminate point obstacles where retaining walls end in cut or fill sections. The "L" type takes its name from being shaped like the letter "L." The footing of the wall may be placed under the proposed fill or as part of a paved shoulder and may or may not have a concrete safety barrier curb for traffic safety. Walls greater than 5 ft. in height are to be identified by a bridge number, which can be acquired from the Structural Resource Manager in the Bridge Division. This is a conventional reinforced concrete type wall supported by a spread footing or pile footing. "Cantilever" type walls greater than 5 ft. in height are to be identified by a bridge number which can be acquired from the structural resource manager in the Bridge Division. Description. Mechanically stabilized earth wall systems consist of a reinforced soil mass placed behind facing units. Types of MSE walls include small block and large block (panel). Information concerning the types, appropriate uses and design of MSE walls can be found in EPG 751.24.2 Mechanically Stabilized Earth (MSE) Walls. Contractors are responsible for performing the design of MSE walls. Only the wall systems shown in the Bridge Pre-qualified Products listing will be available for use by the contractor. When NOT to Use MSE Walls. You must have adequate room behind the wall for the reinforcing straps (need horizontal clearance behind the wall of approximately 0.7 times the height or more if seismic loading is considered). You also can NOT use MSE walls in locations where the underlying soil cannot support the weight of the fill and the wall (rare occurrence). This is determined by the District Geologist/Geotechnical Director. Plans for MSE walls will be developed by the district unless they go under a bridge, in which case the Bridge Division will develop the plans. Exceptions The Bridge Division will still be responsible for producing the plans for any MSE walls that go under a bridge or act as wingwalls for a bridge. Plans District will prepare plans for each wall. (See Bridge Standard Drawings – MSE Wall.) The latest notes can be found in EPG 751.50 Standard Detailing Notes. EPG 751.50 should be checked often to ensure you are using the most up-to-date notes. MSE Wall Nos. District will assign each wall a number using the following system (Dx-000x). Each district will need to keep a log of the wall nos. used. This log should include the beginning station and job no. for each wall no. assigned. Soundings/Borings District will submit the Request for Final Soundings of Structure for each wall to the Geotechnical Director in Central Office. The District Geologist should be copied on this request. Behind the Wall In Cut walls: The excavation behind the walls shall be included in the roadway excavation quantities and identified with the MSE wall. The quantity and cost of select granular backfill behind the walls is included with the MSE wall pay item. In Fill walls: The quantity and cost of select granular backfill behind the walls is included with the MSE wall pay item. Retained fill beyond the granular select fill shall be included in the roadway excavation quantities. For estimating excavation, see EPG 751.6.2.17 Excavation. Below the Wall In Cut walls and In Fill walls: If required, the excavation and fill below the walls shall be included in the roadway excavation quantities and identified with the MSE wall. Excavation and fill requirements below the walls is given in the Foundation Investigation Geotechnical Report an identified as “ground improvement” (also referred to as “soil improvement”, “ground [or soil] mitigation”, “foundation replacement” or “foundation excavation”). Seismic Show seismic performance category and acceleration coefficient on MSE wall plans. See EPG 751.9.1.3 Seismic Design Force Concepts and EPG 751.9.1.4 for this information or contact the Bridge Division. This is only required for the St. Louis District and Northeast District counties of Bollinger, Butler, Cape Girardeau, Carter, Dunklin, Iron, Jefferson, New Madrid, Madison, Mississippi, Pemiscot, Perry, Ripley, Scott, St. Francois, Ste. Genevieve, St. Louis, Stoddard and Wayne. Note: The minimum strap length used for estimating excavation quantities for Seismic (0.95H) is greater than Nonseismic (0.7H). Special Provisions A special provision, “Form Liners”, needs to be included as a Design Special Provision for MSE walls. Other information needed is in Sec 720 of the Standard Specifications. Pay Items MSE walls typically only have one pay item: 720-10.00 Mechanically Stabilized Earth Wall Systems. This is bid per square foot and will now be a Roadway Item when the districts do the plans and a Bridge Item when the Bridge Division does the plans. Other pay items may include form liners, color stain, masonry protector and graffiti protector. Shop Drawings Do NOT send to the Bridge Division. Shop drawings will be signed and sealed by a Missouri PE and the Resident Engineer will handle them like other shop drawings that aren't submitted to Central Office. Engineering Policy Guidelines (EPG) The Bridge Division will continue to maintain EPG 751.24 LFD Retaining Walls. Districts have access to this on the internet. Approved Systems The Bridge Division will continue to be responsible for reviewing and approving systems from manufacturers. Historical Plans The MSE wall plans will be part of the roadway plans so they will be scanned and saved in the same manner. Drainage For longitudinal drain pipes use two-6” (min.) diameter perforated PVC or PE pipes (Sec 1013) unless larger diameter pipes required by design which shall be the responsibility of the district Design division. Lateral drain pipes permitted by specification shall be sized by the district Design division. See EPG 751.24.2.1 Mechanically Stabilized Earth Walls (MSE). Aesthetics For large block walls only, form liners are required to produce all panels. Standard form liners are specified on the Bridge Standard Drawings - MSE Wall. Concrete staining is another aesthetic treatment available for any type MSE wall. Be specific regarding names, types and colors of staining, and names and types of form liner. Help Contact the Bridge Division. The Bridge Division contact person for any questions or concerns about MSE walls is Structural Resource Manager or Structural Development and Support Engineer. The table below shows division responsibilities for preparing MSE wall plans, computing excavation class, quantities and locations, and drainage design. 1 Class and Quantities shown on 2B sheets and identified with MSE wall and excavation locations along wall shown on roadway plans. 2 Class and Quantities shown on 2B sheets and identified with MSE wall and excavation locations along wall shown on MSE wall plans with associated allowable bearing pressure. 3 Locations along wall shown on MSE wall plans with associated allowable bearing pressure. 4 See EPG 751.24.2.1 Mechanically Stabilized Earth Walls (MSE). The absolute minimum embedment is 2 ft. When the soundings are returned from the Geotechnical Director, they will include a minimum embedment necessary for global stability. Bridge rehabilitation may include widening, redecking, superstructure replacement, repairs or other work necessary to restore an existing bridge to serviceable condition. When bridge rehabilitation of any type is proposed, consideration should be given to total structure rehabilitation. For each structure that is to be rehabilitated a Structural Rehabilitation Checklist is completed along with descriptions and photographs of deteriorated members. Seldom are existing elevations and dimensions the same as shown on original structure plans. Thorough descriptions with photographs will aid the Bridge Division in recommending repairs and in estimating repair costs. Deck Elevations. Deck elevations at 10 ft. intervals at the centerline and gutterlines. The centerline elevations may be omitted if high traffic volumes are present and would represent a hazard to survey personnel. Beam Seat Elevations. Substructure bearing beam elevations at each end of each substructure unit. In addition to the Rehabilitation Checklist a complete Bridge Survey will also need to be submitted. 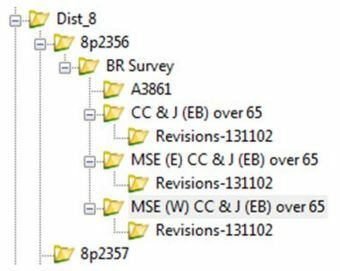 Structural Rehabilitation Checklists and associated documents are submitted as described in EPG 747.2.2.6 Bridge Survey Submittal Process. Submit Structural Rehabilitation Checklist(s) at least 10 months prior to the Plan Completion Date (PCD) to allow time for applicable tests and structural checks. If more than 10 checklists are submitted for one project, the Structural Rehabilitation Checklist should be submitted at least 12 months prior to the PCD. When the rehabilitation of a bridge includes widening of the substructure, the submittal timeline will be as described in EPG 747.2.2.6.5, Bridge Survey Submittal Timeline. Upon receipt of the bridge survey or bridge rehabilitation checklist, the Bridge Division will review the data and make an in-depth analysis of the proposed crossing. The analysis may include hydraulic design of the waterway opening for stream crossings, geometric layout for grade separations, economic analysis of structure types and span lengths, and investigation of any special features evident from the data. If applicable a tentative bridge layout will be prepared. A bridge memorandum will be prepared covering the details of the proposed bridge or bridge repairs. The bridge memorandum is the instrument which coordinates bridge plan and roadway plan preparation. An electronic copy of the bridge memorandum is sent to the district for review and signature. If, during the design process, revision to the bridge memorandum by either the district or the Bridge Division becomes necessary, all parties to the memorandum are to be notified immediately. The proposed revisions must be agreed to by all parties that signed the original bridge memorandum. The process for establishing the agreement on the Bridge Memorandum is shown in EPG 751.1.2.19.5 Bridge/District Agreement Process. The purpose of the soundings (borings) is to define subsurface conditions at the project site. This information will be used to determine type of foundation (driven piles, pile cap footing, spread footings, drilled shafts), preliminary estimate of pile lengths and engineering design properties. Upon receipt of the Layout for Soundings, the district design personnel assists in coordinating the survey staking of the boring locations for the geotechnical section. Once the signed bridge memorandum and final sounding report is submitted to the Bridge Division the Design Layout sheet is created. An electronic copy of the Design Layout sheet is sent to the district along with plan and profile sheets reflecting the proposed structure. The district will receive foundation details, quantities and a cost estimate from the Bridge Division to incorporate into the final project design. Organized Drainage District. Written agreement documenting drainage district approval of the proposed structure layout is to be obtained by the district. Railroads. Written approval from the railroad of proposed structure layout and of the final design plans is obtained by the Multimodal Operations Division with the cooperation of the Bridge Division. U.S. Corps of Engineers Sec. 404 Permit. Application is initiated by the district, submitted to and further pursued by the Design Division with the cooperation of the Bridge Division. U.S. Coast Guard Bridge Permit. When required, application is prepared and submitted by the Bridge Division. Utility Relocations or Permits. Agreements are obtained by the district with cooperation, if necessary, of the Design Division and the Bridge Division. FHWA Bridge Approvals. When FHWA preliminary bridge layout approval or bridge plan approval is required, written approval is obtained by the Bridge Division. Flood Plain Development Permit. Bridge Division will prepare and submit the application to the State Emergency Management Agency. FHWA, Missouri State Historic Preservation Officer (SHPO), Advisory Council on Historic Preservation (ACHP). Disposition of historically significant bridges to be replaced must be determined. Preservation of the historic bridge in place (rehabilitated or for alternative uses such as pedestrian walkway) must be considered. Adverse effects to historically significant bridges from proposed rehabilitations also must be determined. Determining the historical significance and the disposition of such bridges will be coordinated by Design Division Historical Preservation Staff. The Request for Environmental Services (RES) should indicate existing bridges that will be affected by the project. Historical Preservation Staff will coordinate with the Transportation Project Manager to complete the evaluation. This page was last modified on 25 September 2018, at 11:17.